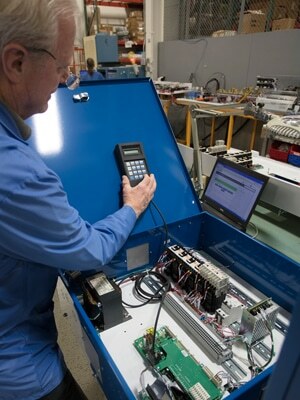 Altek has over 40 years of experience with Box Build Assemblies for full product integration. Our Mechanical Assembly department produces Box Builds as small as 4” x 2.5” with one or two parts in a fabricated enclosure – up to 2’ x 4.5’ with over 400 unique parts in a metal cabinet enclosure. We work within many of the vertical markets such as; Industrial, Commercial, Medical, Telecommunications, and Aerospace. We create solutions for each customer based on their unique need. Our Electromechanical and Engineering team works like an extension of your team, providing a System Integration Solution that you can roll up to your production line. Streamline your design – Altek provides Design for Manufacturability and Assembly (DFMA) Consulting for overall design efficiency. Reduce supply base – Altek can build your PCB assemblies, cables, harnesses, boxes, chassis’, control panels and complete systems. Increase inventory turns – Altek will hold the sub-assemblies until they are ready to integrate into the higher level assembly. Improve on-time delivery – Altek will coordinate acquisition and build of sub-assemblies and coordinate integration into the higher level product to meet your delivery requirements. Reduce defects and returns – Altek will deliver a fully-assembled, fully-tested product that is ready to use right out of the shipping carton. Increase Productivity – As a serious-minded, customer-focused supplier, Altek will streamline your workload by delivering products that work on-time without the need to micro-manage every step of the process. Achieve minority supplier quota – Altek is a Veteran Owned Small Business. Some examples of higher level assemblies built at Altek include power control panels used in fuel cell buses and submarines, enclosures and chassis used to cut, grind and polish lenses, electronic control enclosures used on rotary wide-bed printers for the garment industry, cabinet-sized test rigs for complex capital equipment, chassis and panels for military applications, hand controls used on armored vehicles, among others. We always enjoy sharing our knowledge and collaborating on solutions. Please contact us to talk about your needs, our capabilities or to meet our team.